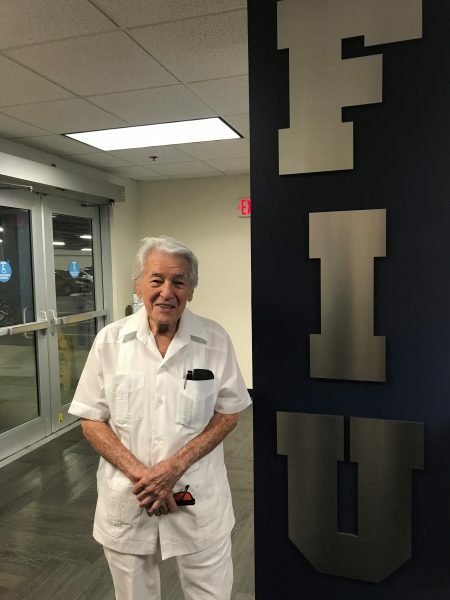 Jose Gracia, 92-year-old engineering instructor. Jose Gracia has lived a full life. The 92 year old has embraced all the challenges life has thrown his way and uses those experiences to mentor youth and inspire them to pursue engineering. A jack-of-all-trades, Gracia has been a boxer, ventriloquist and for the last 23 years, an engineering instructor for at-risk high school students in Miami. 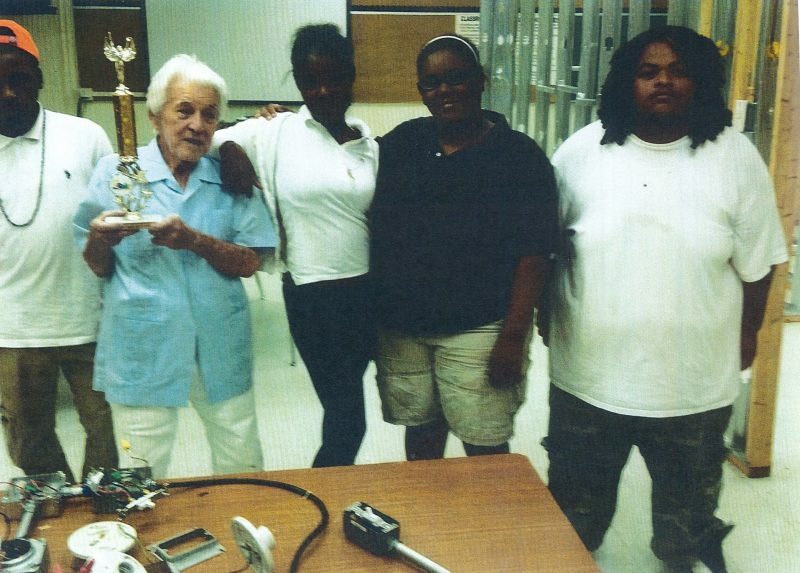 Through a grant from Miami-Dade County Public Schools and FIU, Gracia was hired as an instructor in the 1990s and has taught high school students about electric wiring ever since. His journey to the classroom reads like a Hollywood script. Gracia lived in poverty most of his childhood and adolescent years in his native Cuba. In the 1940s, he worked for an electric light and power company cleaning the tool room. He’d also sleep in the tool room because he couldn’t afford a home. While working at the electric company, where eventually Gracia was promoted to an inspector, he started boxing to make a few extra dollars. From 1943 to 1947, Gracia would fight at boxing tournaments across Cuba, getting paid $15 for each match. 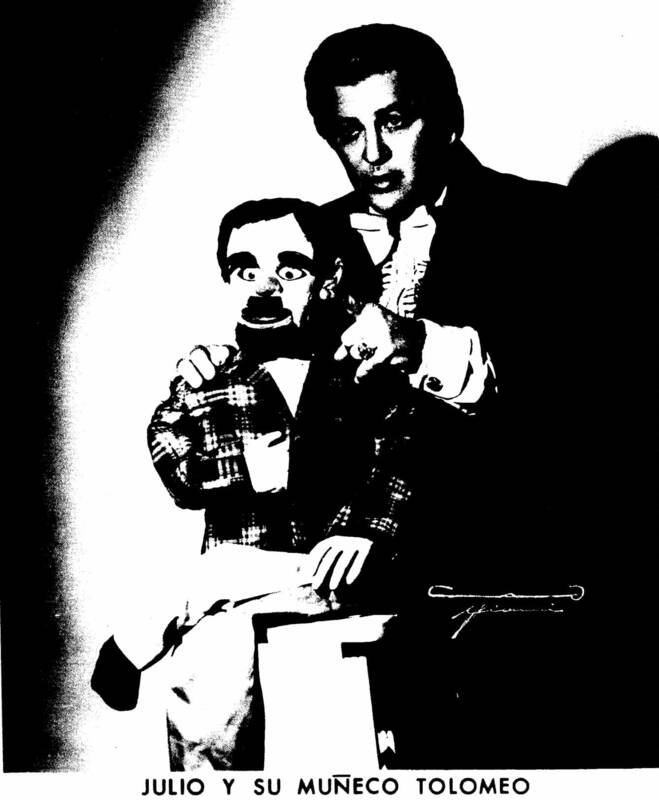 Jose Gracia as a ventriloquist with his doll, Tolomeo. 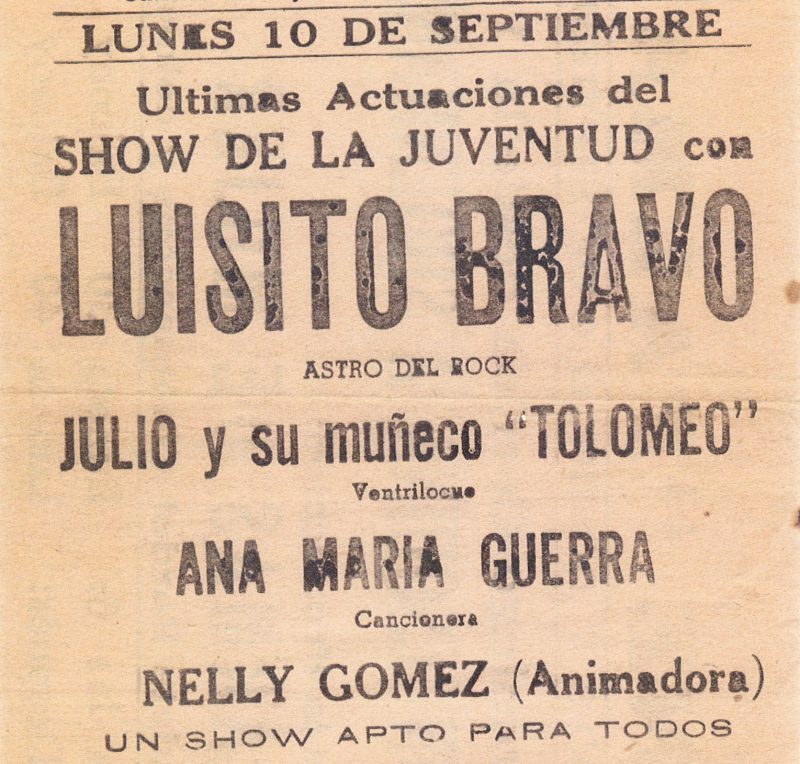 A photocopy of a flyer for several shows in Cuba, including Jose Gracia and his doll, Tolomeo. Around the same time as boxing, Gracia decided to take on another project. When he was a boy, he enjoyed playing with his sister’s doll and would set up a comedy show in their backyard. In 1945, Gracia purchased some cardboard, paper, a child’s suit and a face to create a ventriloquist doll. Gracia named his doll Tolomeo. Whenever he was able to get time off from work, Gracia would perform at several theaters in Cuba, including Cine Palma, Cine Manzanares and Cine Tosca, with the stage name Julio y su muñeco, Tolomeo (Julio and his doll, Tolomeo). Gracia’s future was looking bright, however due to political reasons, he knew he had to leave Cuba. On March 17, 1964, he and his wife hopped on a boat departing from Camaguey and headed to the United States. There were a total of 11 people on the vessel. Shortly after arriving to the United States, Gracia and his wife moved to New Jersey, where he became a licensed electrician. He used the skills he obtained as an inspector at the electric company to work for multiple companies in the New York tri-state area, including the Radio Corporation of America (RCA) from 1968-1976. At RCA, he worked with a team of electricians installing and maintaining electric wiring. Gracia also worked fixing motors of the New York City subway trains. 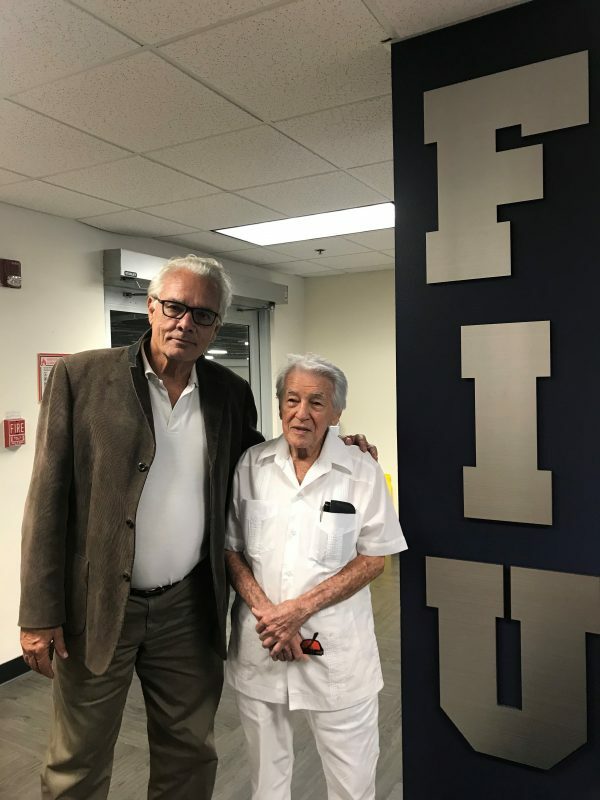 Amaury Caballero, university lecturer at FIU, and Jose Gracia. Gracia eventually moved to Miami with his wife and family, where he worked in the heating, ventilation and air conditioning industry (HVAC) for a few years. He recalls meeting a customer that went by “Silva,” who helped usher a new chapter in his life. Silva took Gracia to Miami Douglas Macarthur South Senior High School to meet Caballero, a university lecturer for FIU’s Department of Electrical and Computer Engineering, who has been working at FIU since 1993. Caballero and Gracia connected right away. Gracia teaches at Miami Douglas Macarthur South Senior High School, Barbara Goleman Senior High School, Robert Renick Educational Center and Miami Central High School. He teaches the high school students about electrical wiring, electrical tools and how they work. His curriculum includes projects that are practical and very hands-on. His mission is to inspire students to pursue STEM-related jobs, primarily in electrical engineering, and stay focused in school to not fall back into bad habits. Jose Gracia with several of his students. “These are students who are at-risk, who could have problems with the law, who don’t come from good families, but here they are trying to better themselves — and I’m happy to be a source of support,” Gracia says. What a great story, and what an amazing man. I am proud to call Professor Gracia friend and colleague. FIU should grant Jose Gracia an Honorary Doctorate degree in Electrical Engineering.